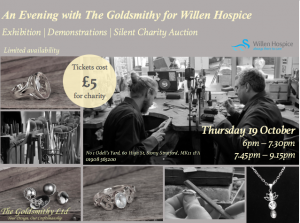 On Thursday 19 October, we’re opening up our doors for live demonstrations, an exhibition of our exquisite jewellery creations, and a silent auction to raise money for Willen Hospice. We’ll be hosting two tickets times at our workshop – one from 6pm – 7.30pm and another from 7.45pm – 9.15pm. Tickets are limited and will cost £5 which will be donated to Willen Hospice. Guests will enjoy a glass of bubbly on arrival as they explore some of the bespoke jewellery pieces’ we’ve created in the 7 years we’ve been in O’dells Yard. Cartier trained Glenn Chapman, is creating a limited edition coin to commemorate MK50 which will be up for auction on the evening, along with 5 unique pieces of jewellery specially made for the evening by Paul Chapman. All the proceeds will be donated to charity. The evening will include a live demonstration of us showing some of the making processes; from melting down metal, to skilfully crafting shape and filing a piece of jewellery. One member from the audience will also get the chance to have a go at the bench – something we offer to customers having bespoke jewellery made.